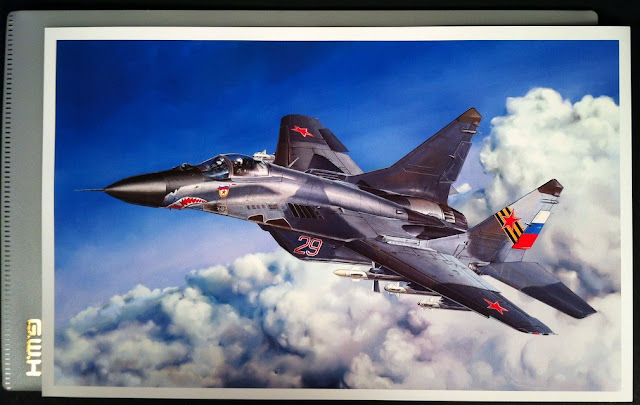 When Great Wall Hobby released their 9-12 version of the MiG-29, it brought a lot of praise as being the best MiG-29 in 1/48 scale. 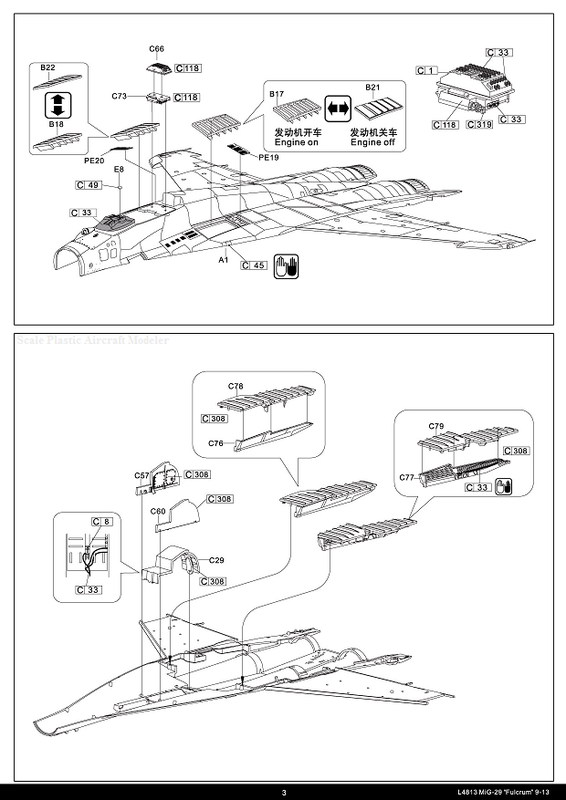 Now Great Wall Hobby has also released the 9-13 version which has the enlarged spine running down the fuselage for which it would contain additional fuel capacity and jamming equipment. Now you can’t talk about the 9-13 kit without first looking at the 9-12. 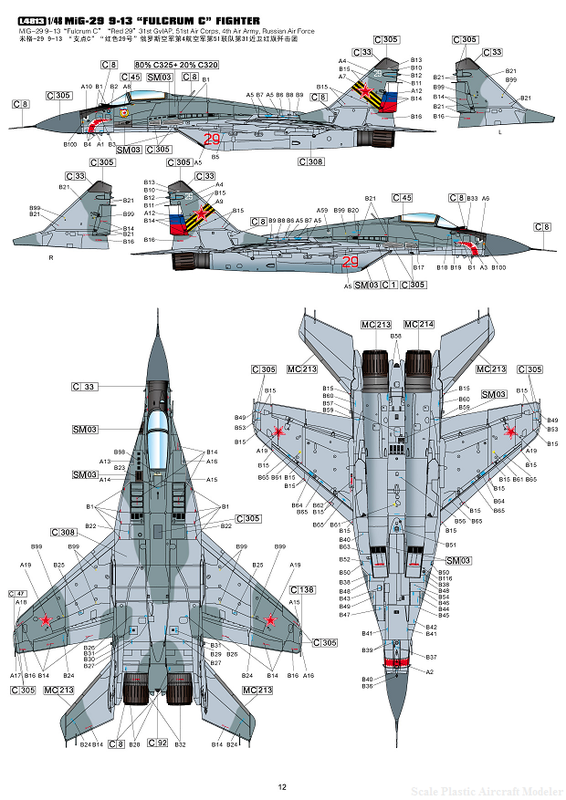 Even though the 9-12 kit set the bar as being the best MiG-29 in 1/48 scale (and quite possibly in any scale), it still would suffer from slight issues. 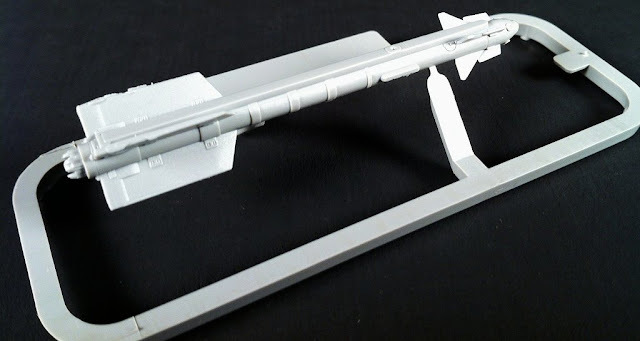 Some modellers have complained that the upper fuselage would arrive slightly warped in the wings, (which was later found out to be a shipping issue distorting the upper fuselage half) which was remedied by Great Wall Hobby with replacement parts. 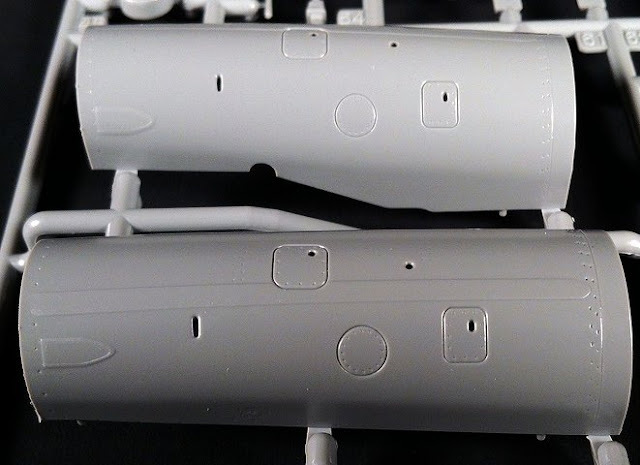 Another issue with the 9-12 kit was the fitment with the engine intakes and engine covers not having the best fitment during the construction of the kit. 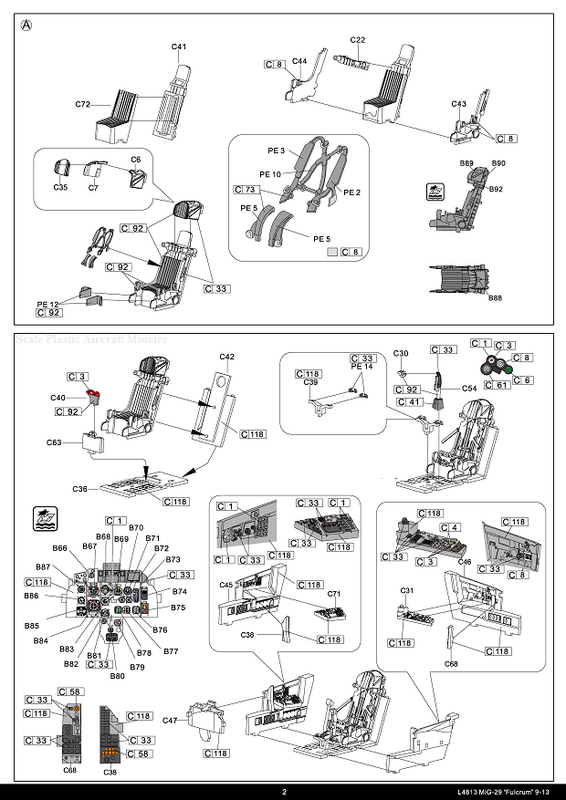 Last was the instruction manual which had you build the kit in odd steps or wrong steps. 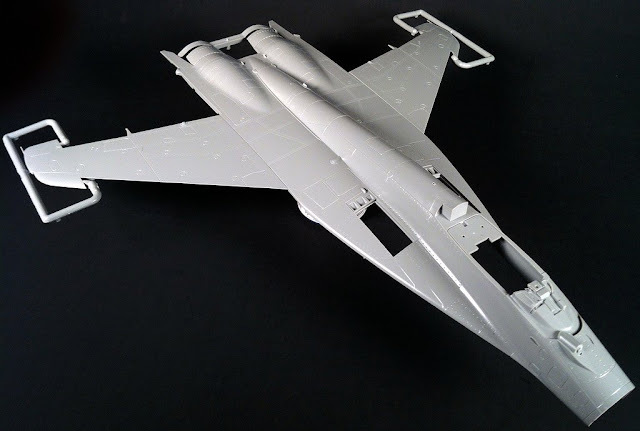 So this led to Great Wall Hobby taking the MiG back to the drawing board to fix these issues and add a little more to the 9-13 kit. 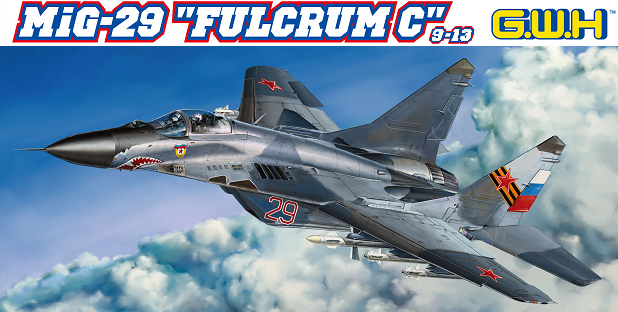 All the hard work has paid off with this new release and the title of best MiG-29 in 1/48 scale will shift (if it hasn’t already) to the 9-13. 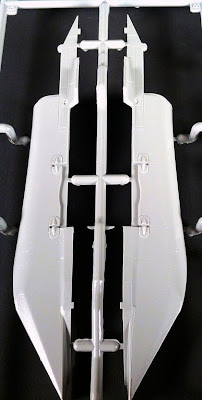 When you first look at the new 9-13 it is nearly identical to the 9-12 boxing besides the obvious enlarged spine in the upper fuselage but a closer look at the kit will show its subtle differences. which we'll talk about now. 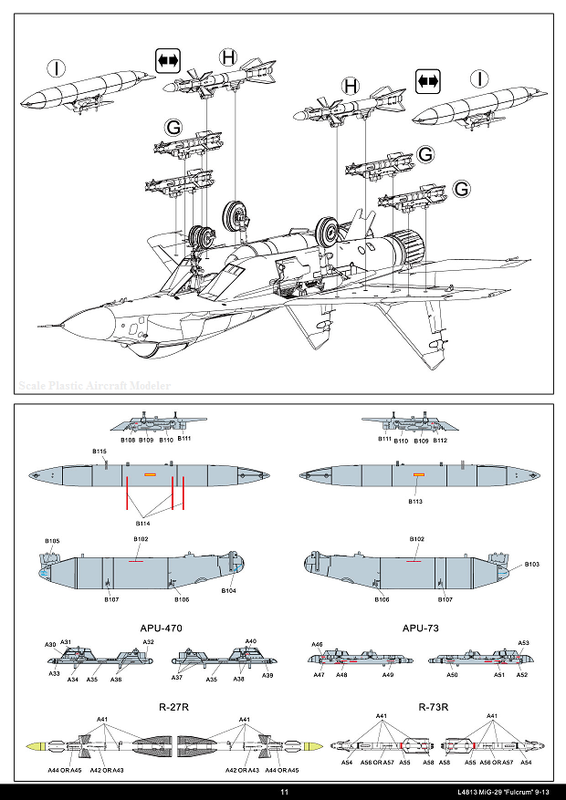 First we will look at the upper fuselage half; again the 9-13 has a large spine due to the additional fuel capacity and electronic jamming equipment. This piece contains recessed panel lines which vary in depth depending on the panel. The rivet detail is also recessed and has certain rivets containing detail instead of the simple depression in the styrene. This gives the kit a more “realistic” feel verses the all lines, same depth look. 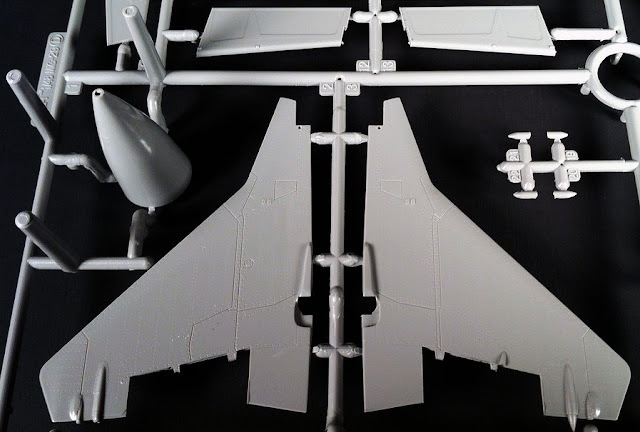 Since the issue with the “warped” upper fuselage wings on the 9-12 boxing of this kit, Great Wall Hobby took the extra step to store the 9-13 upper fuselage half in its own sturdy box. 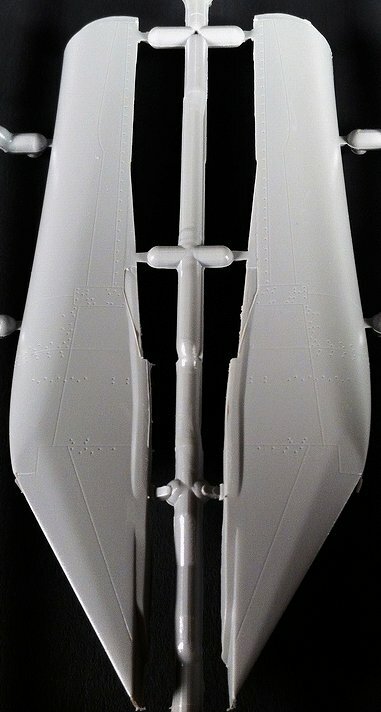 Onto the lower half of the fuselage is pretty much the same as the 9-12 (could not see a difference) but like its upper half counterpart contains beautiful detail with the same technique with the panel lines and rivets. The horizontal and vertical stabilizers contain very nice rivet detail and panel lines. 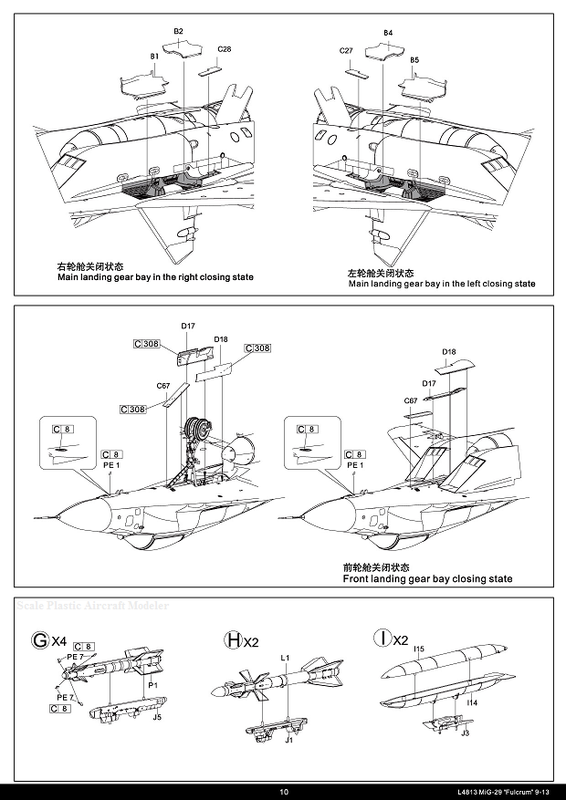 Note: when installing the horizontal stabilizers, do not glue them in place, they will need to be able to move to allow proper installation of the vertical stabilizers. No fitment problems here, Great Wall Hobby did an excellent job with the fit of these parts. Now here is something that is a beautiful part, the canopy. NO SEAM on the canopy! 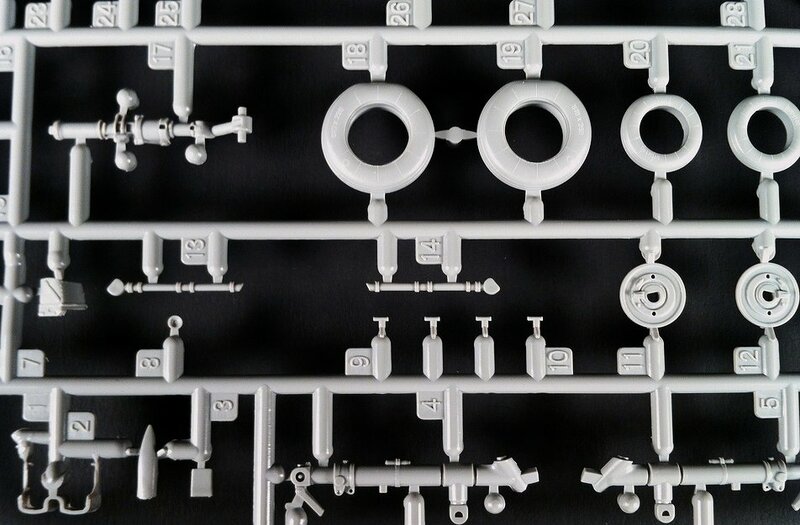 It is a perfectly made part, thin without being flimsy and has really great detail. 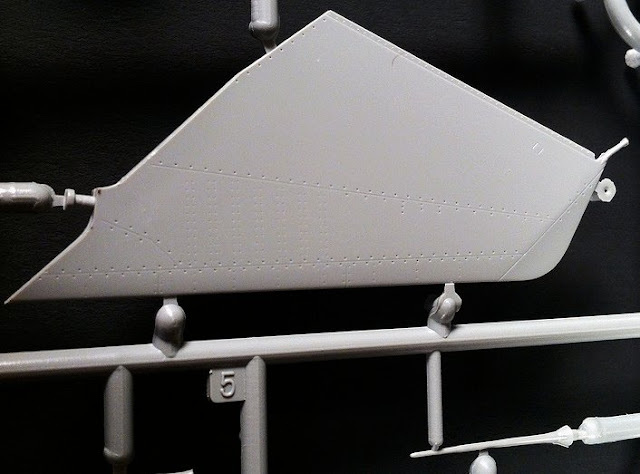 The windscreen is also a perfect part too; Great Wall Hobby did an excellent job representing the lines in the windscreen as is on the real aircraft. The installation of these parts are trouble free. Now for the change, the 9-12 kit suffered from a slight fitment issue with the engine intakes and engine covers. 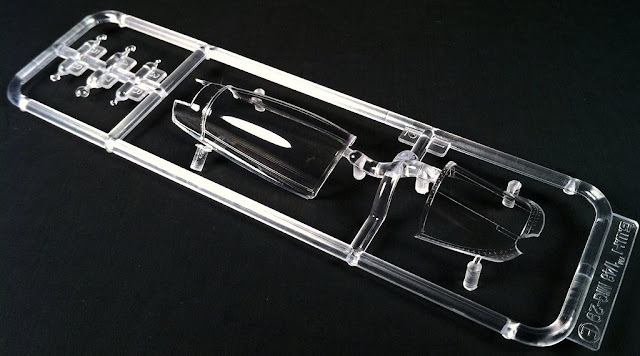 The remedy for this was to install the engines, intakes, and covers (if the modeller did not want to have the engines exposed) prior to gluing the fuselage halves together as there is more play in the plastic to get the parts to align better. 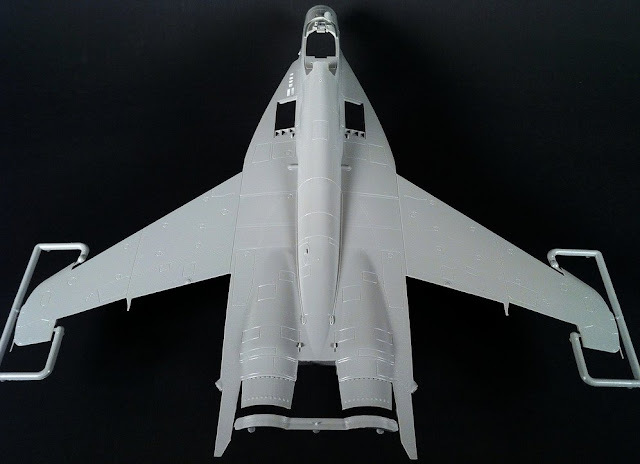 Great Wall Hobby went back to the drawing board and redesigned the mating surface of the intakes where they would be glued to the lower fuselage half. 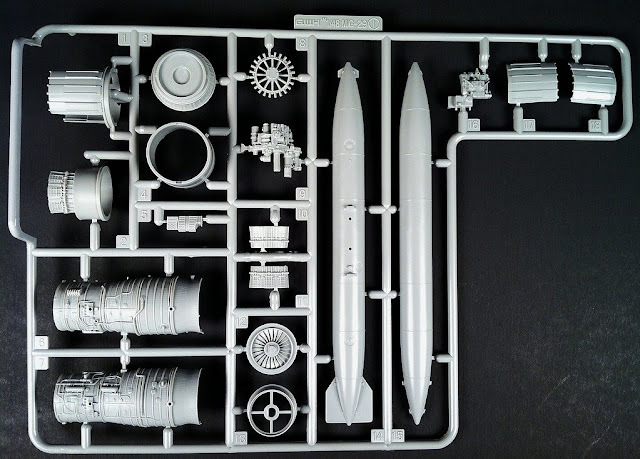 Since we are in the engine area we will take a look at the engine sprue (only one pictured but you will have two of these sprues in your kit) which has a lot of beautiful detail that gives the modeller the option to either cover up it all up or expose the engine/s and the amazing detail they contain. 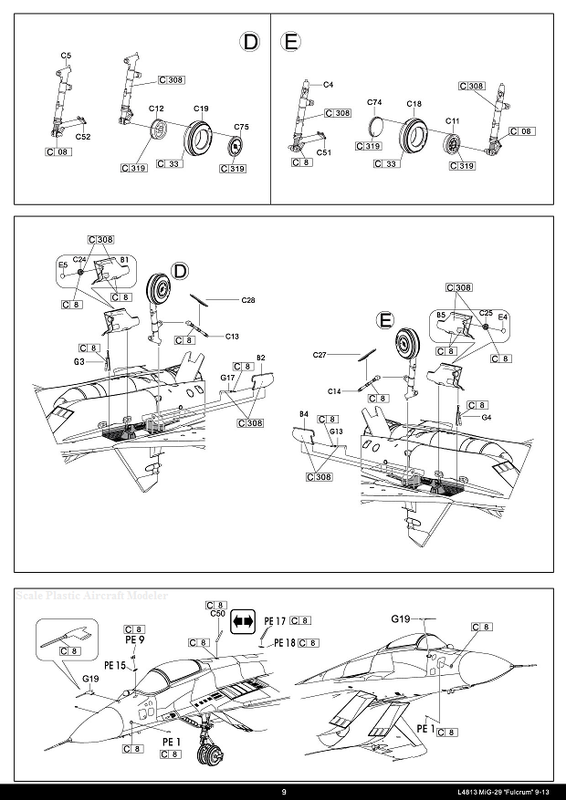 Looking at the main landing gear wheel wells remain it remains unchanged from the previous kit. 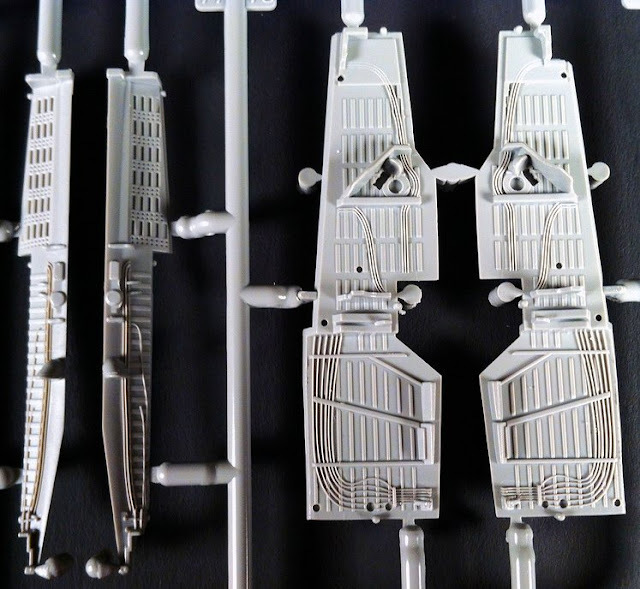 They contain great detail but do require extra care when removing from the sprue, trimming, and final assembly. A word of advice, take your time! 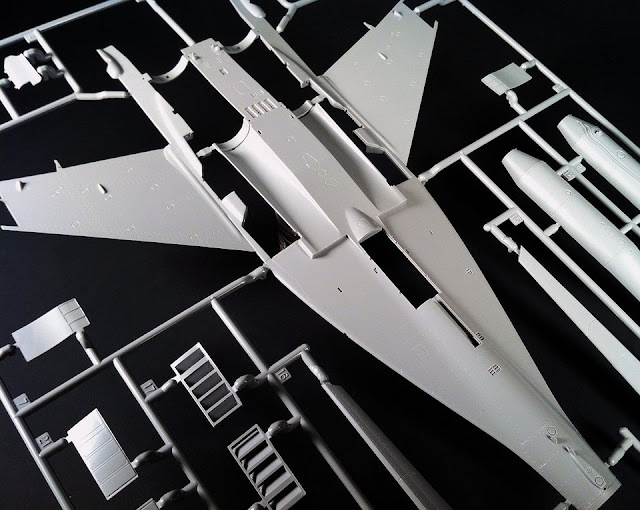 Seeing as the landing gear parts are on the same sprue with the cockpit I will quickly go over that as well. 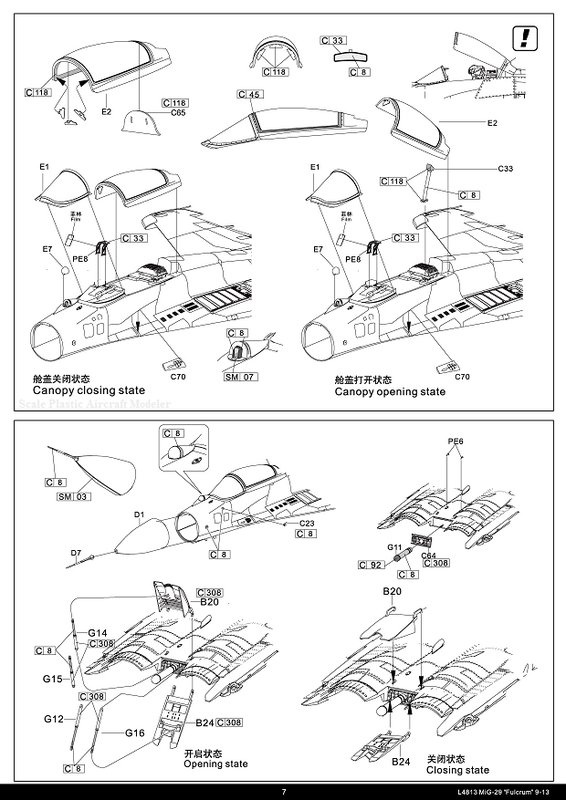 Basically no changes occurred in the cockpit but it really didn’t need updating except for the ejection seat head rest. In my opinion the head rest would have been great if it was made like the Eduard Brassin MiG-29 headrest which was one piece, I would say even two pieces would be ok but Great Wall Hobby made this a three piece ordeal… Extra time is needed to make sure it is put together correctly without having to use any putty which can be an adventure in itself. The IP of the cockpit is a beauty and simply painting and using the kit decals (along with a wash) will give you a really nice IP! 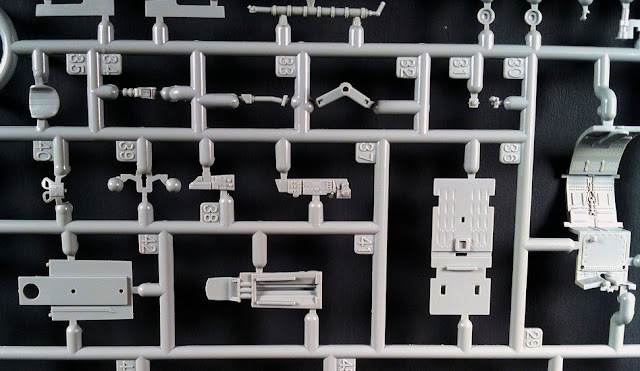 Now we will look at the missiles and missile mountings, all of which contain amazing detail along with the rest of the kit. I could try to say how crisp these parts are but will let the photos doing the talking on this, WOW! A nice plus is the way these are packaged in a plastic case to prevent damage. Great planning ahead! 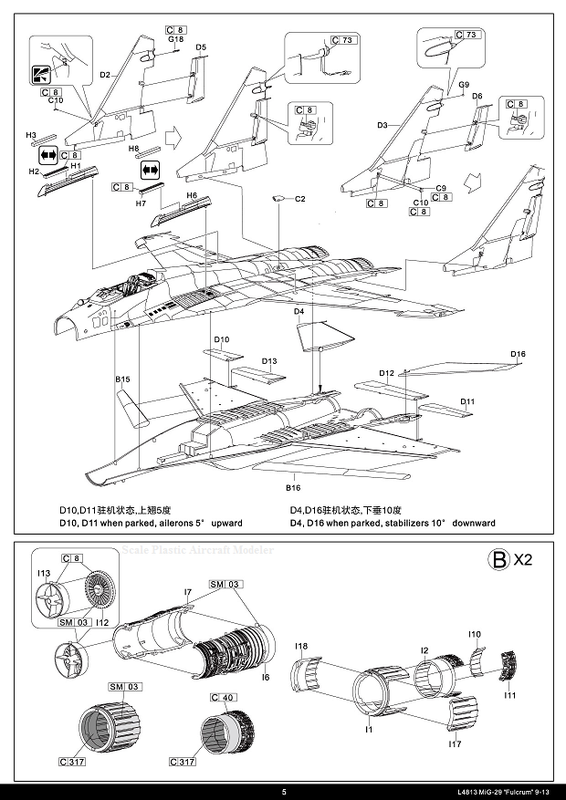 Great Wall Hobby gives two options for aircraft markings, both of which are Russian schemes. Unlike the 9-12, the 9-13 did not have nearly the same amount of operators so the scheme choice is a little on the lower side but plenty of aftermarket decals are out there if you so choose. The decals themselves are sharp and clear. No imperfections at all were found on the sheet and having already used these decals; they are trouble free and work well with Micro Set/Sol. The PE sheet is pretty good. 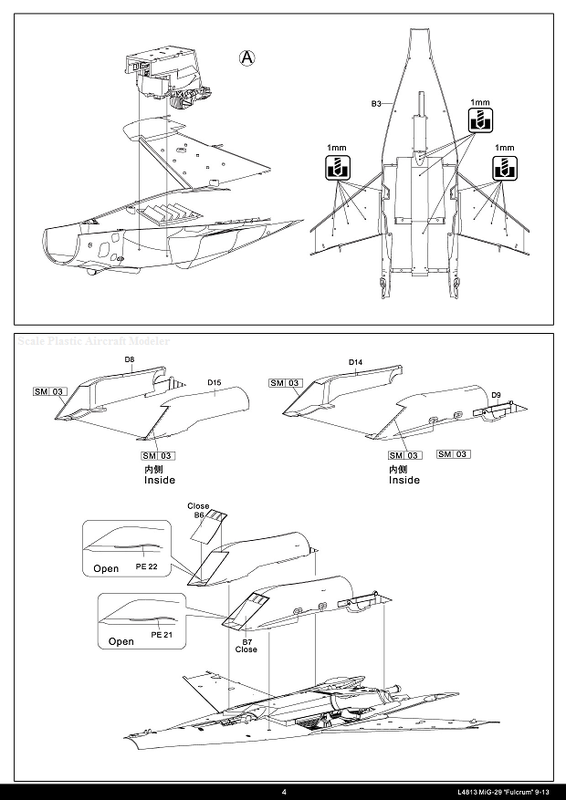 Yes the improvement is in the FOD doors that if you chose to have them open, you would use the PE part which looks a lot better but the ejection seat harness is pretty bland if not a pain to deal with. One might want to consider getting the Eduard set or scratch build one out of textile belts. 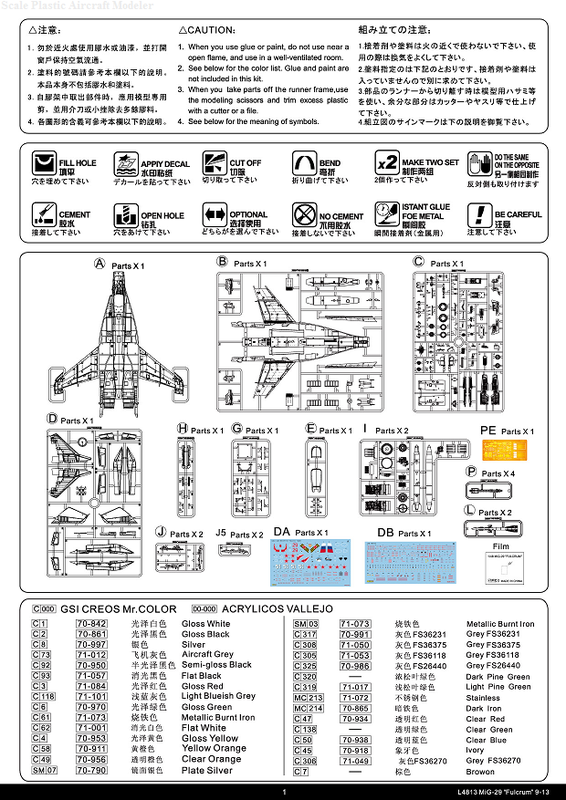 And for the bonus, Great Wall Hobby has included the box art on a separate sheet in a protective folder. A great picture to frame and hang on the wall in your modelling area (or if the wife will let you put in the living room). 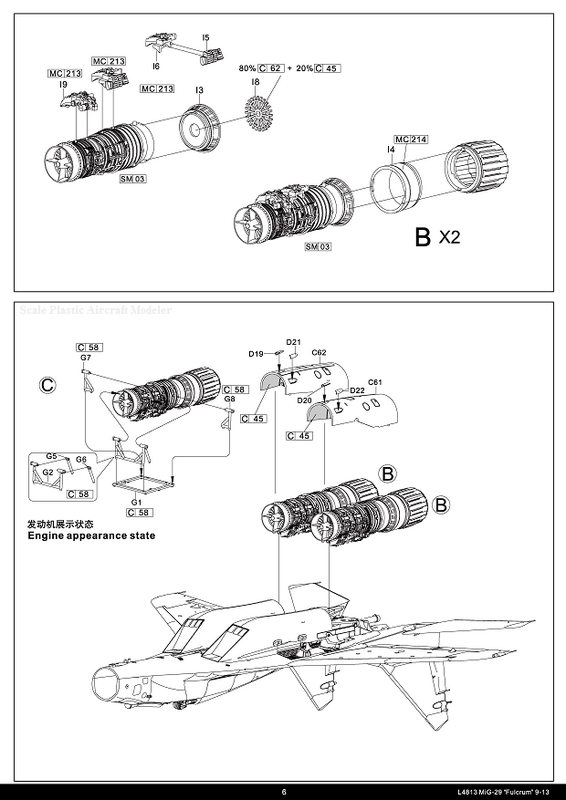 The last part of the kit to look at is the improved instruction manual. 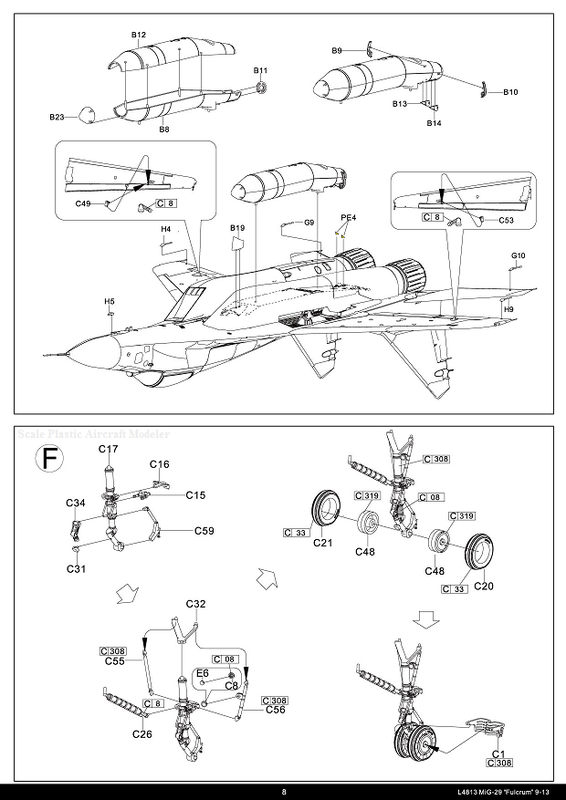 Images are clear (CAD like) and easy to read, there is now an order to the build. A big improvement from 9-12. 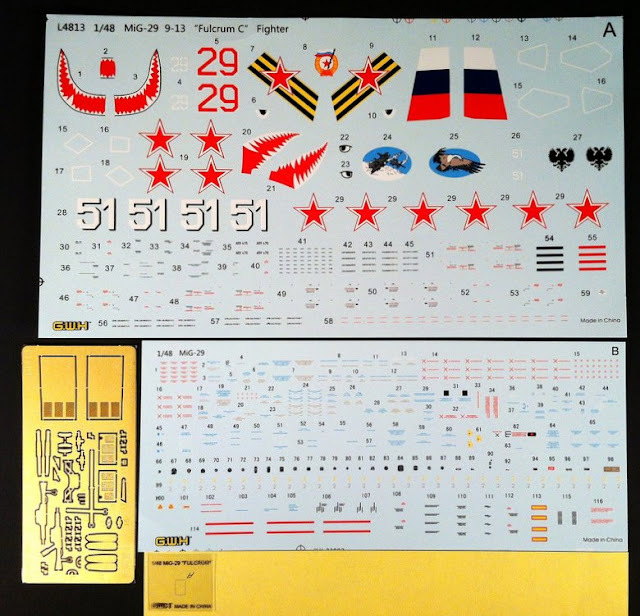 So overall this kit is one that is a must for MiG-29 fans. The amount of detail that is in this kit makes this a gem in my book (even with the few small issues). Some may say that the price tag of the kit is a little on the high end but when you take into account the amount of work and money you would spend to make other kits to come close, this one ends up being a better choice. Taking into account the small issues in this kit I give this one a 9.8 / 10. Almost a perfect kit, improved over the 9-12, the BEST out of ANY MiG-29 kit in all scales and an amazing kit overall.